Core'dinations Cardstock is a beautiful innovation offered in the Coredinations Cardstock Store to showcase the two-toned inside and outside coloring of this paper and the 4 different products – all cardstock made with 2 different colors. This Piece of Core'dinations ColorCore Cardstock was embossed first. The left edge was torn revealing a coordinating color on the inside and the right half was sanded, also revealing the core color at the raised embossing. The Coredinations Cardstock Store at the bottom of the page features all these beautiful products. When you tear this cardstock the inside color will show on the tear. 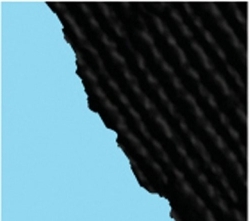 When you sand or distress this paper, the inside color shows through. When you emboss this paper and then sand it, the look is just stunning. All the paper is acid and lignin free - just perfect for your Scrapbooking and Card Making needs. Glitter Silk has a smoother surface so adhesives stick better. The Glitter actually stays on the Cardstock. It folds well without cracking so it's great for card making and other paper crafting projects. The back of this cardstock is white. This particular product it not meant to be sanded. Here's a collection of the Coredinations Color Core Cardstock to match the Tim Holtz Distress Inks we have come to love so much. Here's a collection of the Coredinations Color Core Cardstock to match the Tim Holtz Adirondack Inks. 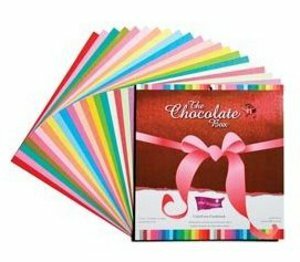 Core'Dinations - The Chocolate Box Cardstock Assortment - Just like you get in a box of chocolates, the outside of these papers is either Dark or Milk Chocolate with a Rainbow of Colors in the center just waiting to break through. Tear them; Cut them; Sand them, Scrape them; Crumple, Bend and Twist them for ways to bring the hidden colors to the surface for a beautiful and unique look! Click here to see more Core'dinations ColorCore Embellishment Examples used in Layouts. This collection offered in the Coredinations Cardstock Store features (20) sheets in twenty different combinations of chocolates and fillings with a canvas texture in a heavy 80 pound weight. With color names such as Cherry Cordial, Caramel, Amaretto, Orange Cream, Maplenut, Bananas Foster, Pistachio Nut, Key Lime, Chocolate Chip Mint, French Mint, Dewberry, Cool Mint Truffle, Blueberry, Blackberry, Raspberry Cordial, Berries Jubilee, Black Cherry, Hazelnut, Strawberries‘n Cream, and French Vanilla, you can just imagine what these beautiful colors must look like and what they can do for your paper crafting. They are available in the Coredinations Cardstock Store in 20-sheet bulk packs of the same color or in a 20-sheet 12×12 assorted packs with one sheet of each color. Core'Dinations - Whitewash Cardstock Assortment. The Whitewash Cardstock Assortment has each sheet of 20 different core colors covered in a whitewash finish that is fabulous for distressing. Sanding, tearing, and embossing the white wash finish will reveal the fabulous core color. This is available in the Coredinations Cardstock Store in 20-sheet bulk packs of the same color or in a 20-sheet 12×12 assorted pack with one sheet of each color. Core'Dinations - Black Magic Cardstock Assortment – Just the opposite of the Whitewash, here the gorgeous core colors are hidden beneath the Black Surface and are also revealed by sanding or tearing. The beautiful core color on the reverse side makes them perfect for cardmaking and photo matting. These come in 4 Collections,all available in the Coredinationsl Cardstock Core. Each of the four assorted packs has one 12×12 sheet of 20 colors. Caldron has the Tonal Pastels Underneath. These bulk packs “Core’dinate” perfectly with the Vintage Collection Colors. Core'dinations - Vintage Cardstock Assortment – Thesecollections are “pre-sanded” and these sheets give you that vintage look and the core color of white shows through without having to distress. Each collection contains one sheet each of 20 different colors. Each of the four assorted retail packs has one 12×12 sheet each of the 20 colors - all avilable in the Coredinations Cardstock Store below. The Flower Power Pack pack has the softer tonal colors. Core'dinations Essentials Collection - All 160 sandable colors are available in 20-sheet 12×12 bulk packs. This canvas textured cardstock has a core color which coordinates with the surface color. Each Core Essential color is also part of an “All In The Family” color group for easy matching. Each of the 40 Color Core Cardstock families is available in 8.5×11 and 12×12 assorted packs. Each pack contains five sheets of the four colors in the family. The 40 "All in the Family" groups are Classic Reds, Berry Reds, Rosey Reds, Just Peachy, Sunset Oranges, Citrus Oranges, Autumn Oranges, Sunflower Yellows, Harvest Yellows, Olive Greens, Springtime Greens, Forest Greens, Shamrock Greens, Grass Greens, Out to Sea, Produce Greens, Teal Blues, Lime Greens, Turquoise Waves, Vacation Blues, Cobalt Blues, Aqua Blues, Indigos, Brilliant Blues, Violets, Sky Blues, Ocean Blues, Lavenders, Luscious Lilacs, Grapes, Orchids, Pretty in Pink, Dusty Roses, Creams, Chocolate Delights, Coffee Café, Sandy Tans, Nostalgic Greys, and last, but not least, Fade to Black. The Ebony & Ivory Collection - has the Black Magic, WhiteWash and Core Essentials together in the same pack. The Jenni Bowlin Core Impressions Collection is an exclusive collection of Jenni Bowlin Studio designs pre-embossed on Core’dinations Cardstock. 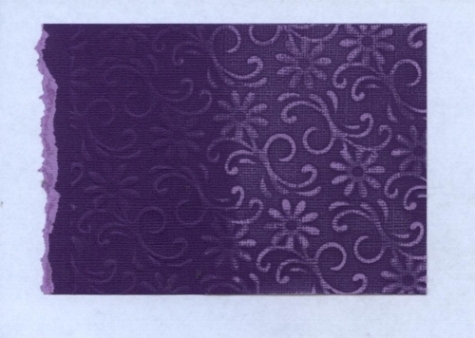 Four pre-embossed patterns are available in 5 colors totaling 20 unique sheets. The Sugar and Spice Collection is made up of Chocolate Box, Vintage and Core Essentials. And then there are the Super Assortments - an 80 sheet pack, with two sheets each of 40 different colors. These are available in four different shade groupings in the followingsizes: 12×12, 8.5×11, 6×6, 4.5×6.5 and 1.75×12 inches. So Mod! - An exciting collection of fun, bright colors. Roy B. Biv - An essential collection of primary colors and a few more. Elements - A collection of Mother Nature’s colors. Nostalgia - A beautiful collection of soft tonal colors. Our Coredinations Cardstock Store below has a selection of the Core'dinations Cardstock that you may wish to add to your collection of Scrapbook Supplies. They can bring your crafting to a whole new level!